The alarm clock went off right on time and my first thought, after turning it off, was, what a very nice nights sleep I had had. The best of the trip so far. 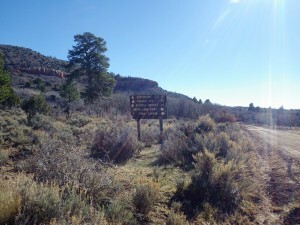 My mind then settled into the fact that we had just spent our first night up on the Salt Creek Mesa and even though there had been a bit of a breeze during the night it wasn’t a howling wind like it could have been being that high up on the ridge. I remembered looking out the window from my bed sometime during the night, I’d guess 2 a.m.’ish and noticing how bright it was outside. The moon was in its 3/4 ths full point and it was almost as bright as if it was full. What would that do for the elk? Would they feed all night and go to bed early, or would they feed for awhile, bed, and then get up during the day to feed and go to water? I don’t know elk and their habits, but I’m convinced the moon is going to be playing a big role. For some reason the coffee tasted extremely good this morning and I had three full cups while waiting for it to get light enough for our trip out of camp. 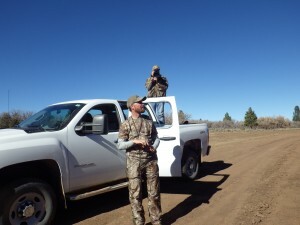 I told Weasel and Tracker that I was putting the muzzleloader away and going to resort to the 7mm (Pork gun) from this point on. 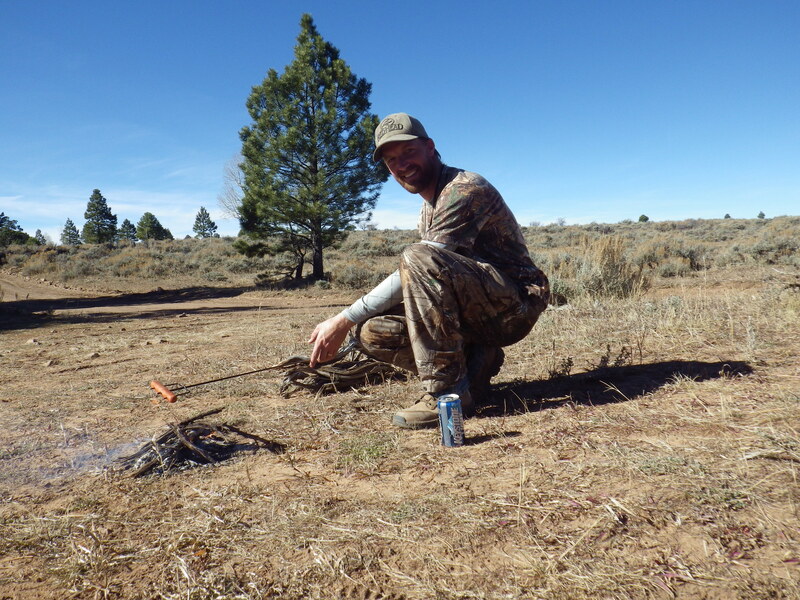 I felt I needed the extra range that the Pork gun would offer and that I wanted to kill a bull elk as soon as it presented itself. 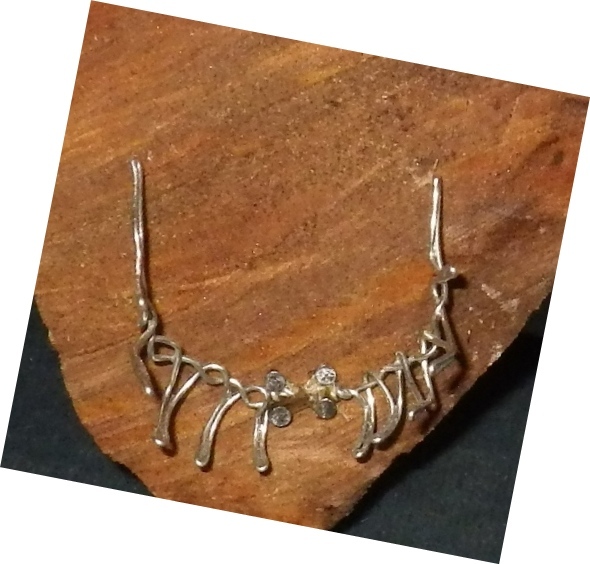 Spike, branch antler, whatever, it didn’t matter. They were ok with that decision. We pulled out of camp when it was light enough to see my sights and headed up the road. 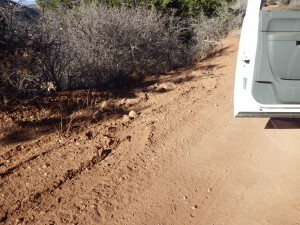 There is a narrow place in the road between Cathedral Butte and the edge of the mesa we are on and in that narrowing of the ground were several fresh elk tracks in the dusty road. 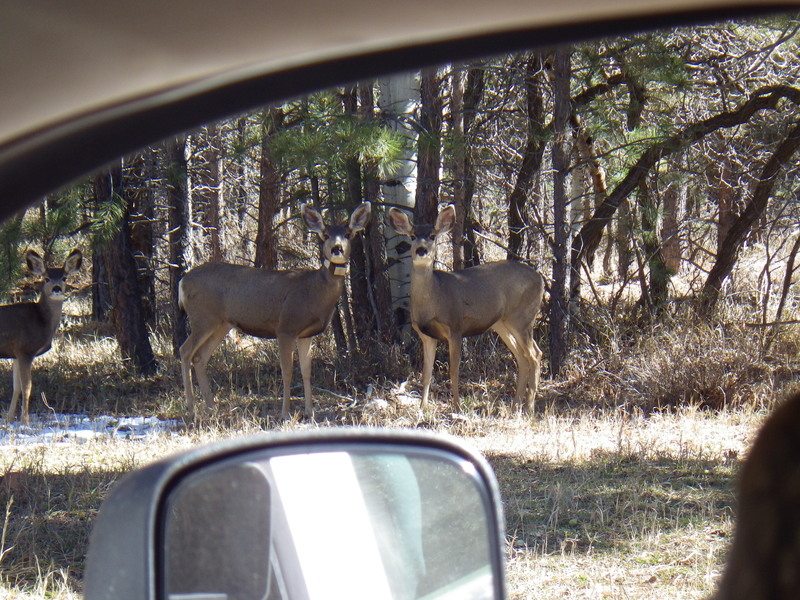 There were also a couple of nice buck deer that ran toward the butte. Up the road about a half mile the mesa widened and there was a side road that led into another chained and partially cleared area. 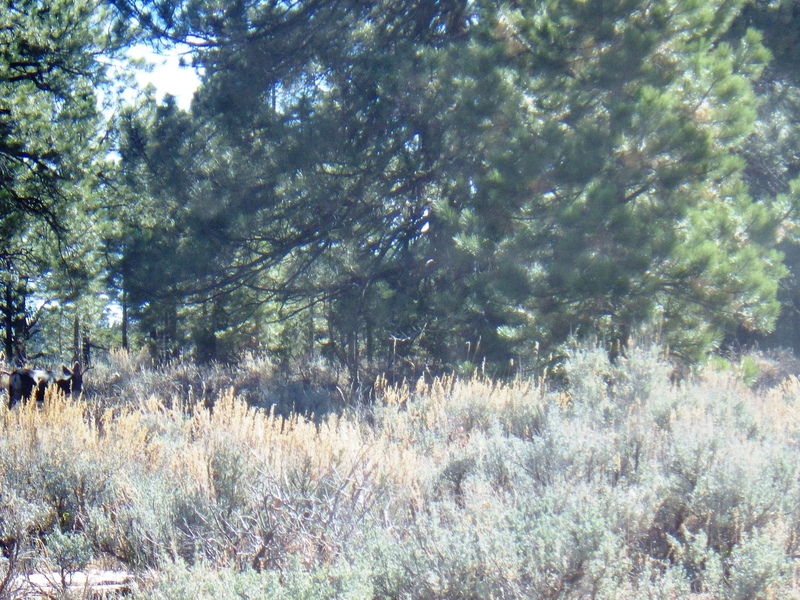 We stopped to go take a look and see if we could see some elk out in there. We must have had our heads up our behinds, because we were not very quiet as we walked down that dirt road, because as we neared the clearing you could hear the thunder of a thousands hoofs pounding the ground out in front and slightly to our left. Soon the sounds were all coming from our left side and you could begin to see the dust rising above the brush as the stampede got farther and farther away from us…we saw nothing but the dust, but clearly it was a very large group of elk that had either seen us or smelled us coming their way. DANG! We learned something then. No matter what…when you leave the vehicle and go off on a “lookeesee”, go slowly, go quietly, keep looking in every direction, keep your ears and eyes constantly on alert. We were busted on that attempt, but maybe, if we don’t down an elk before, that they will be back in this chained area this evening. We had made sort of a plan to go up and check out another area the Mr. Shumway had told us about, North Long Point. He told us about some springs up in their and that perhaps it would be a good thing to go and check that area out. So, today our plan is to go in that direction and take in all the sights we can find along the route. That route took us past the point at which we had turned around on the first day of the season. And from there on it was new country to us, and beautiful country it was. Just like before, we were not seeing any sign of elk along the road and it seemed the higher we went we climbed up and away from the Cedar and Pinion Pine and into Yellow Pine and Quakies. Very beautiful and I’m sure that earlier in the year the elk would be abound in this area. We came to a branch in the road, one that if we took it would take us down into Beef Basin. 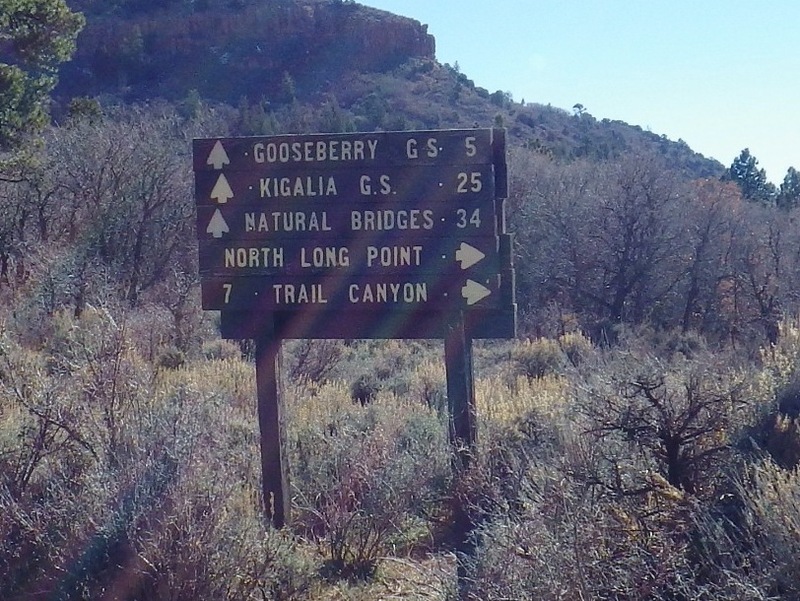 The sign says, from top to bottom, Gooseberry GS (Guard Station) 5, Kigalia GS 19, Beef Basin 12. I’d have to be eating peyote buttons for a while in order to make a horse out of that, but if that is what they want to call it, then that is what it is. Continuing down (up) the road we passed Colt Mountain and again toss me some more of them buttons, but the view got prettier and prettier as we went. More tall pines and loads of quakie pockets. You would be hard pressed to find a prettier place. 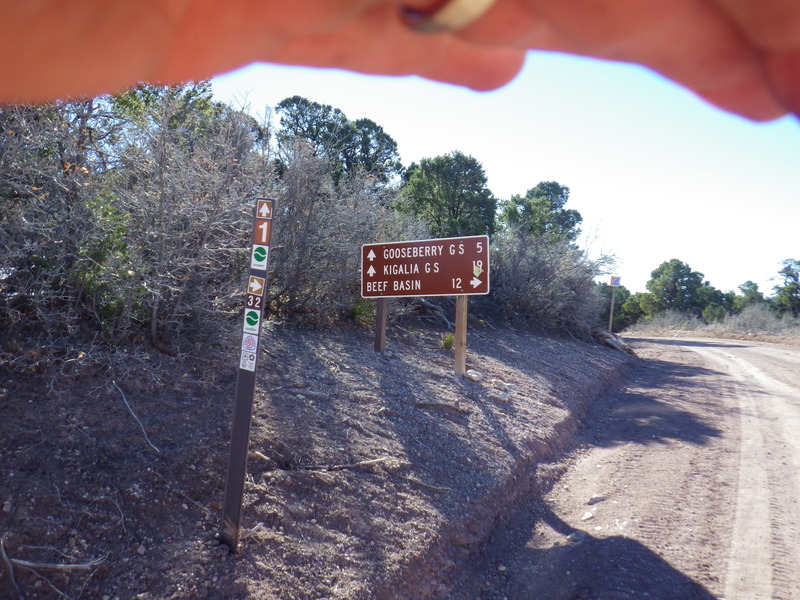 Still, no elk sign. And then here we came to our junction, the one down and out North Long Point. Hold on just a second here! What does that sign say? Let’s look closer! Do you see anything odd about this sign? The last sign said Gooseberry GS 5 miles! We just traveled 5 miles to this sign and still have 5 miles to go? What gives? Better than that, the sign before said Kigalia GS was 19 miles and now it’s 25 miles away! If I was walking I would be mad as heck right now! Hey Mr. Forest Guy, how about fixing one or both of these signs so we know which is right! Well, that made for a good laugh, and we made the turn down North Long Point in search of some big old bull elk. Or maybe just a place we could eat another long awaited hot dog. We are beginning to look like hot dogs! We traveled down North Long Ridge for several miles and during our drive we saw a very amazing little squirrel…I guess it’s a squirrel. It never let us get a picture of it, but I’ll describe it as best as I can. It stood about 10 inches tall, was quite bushy, its ears were pointed and tall for a squirrel and its tail was not only bushy but rather white or light grey in color. You tell me what it’s called. Post the name in comments below and I’ll make sure it becomes part of this story. We continued down this road until we were supposed to come to a Big Spring. 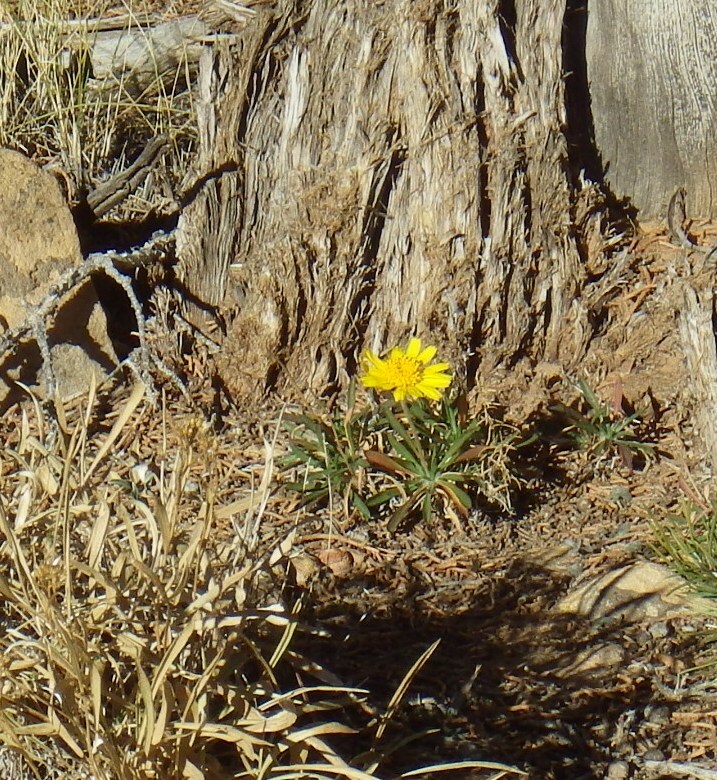 We never saw any Spring, but we did see a big grove of quakies down off a cliff in the general area and figured it was here that the spring was….close enough…let’s eat! 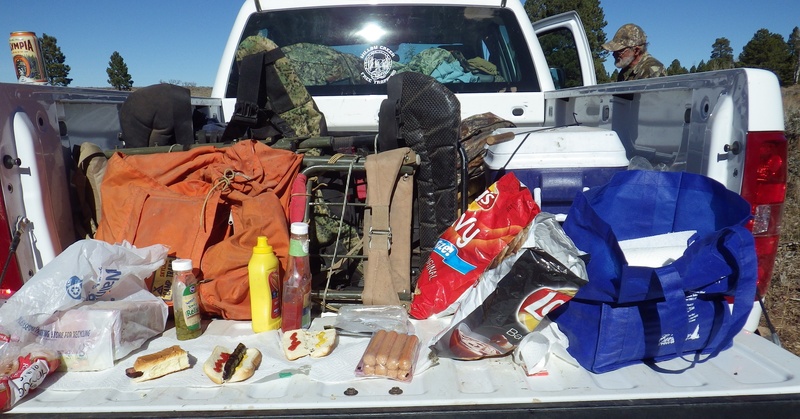 I’m not sure I would ever get tired of having hot dogs, chips and beer for lunch while out in the woods. There is just something very special about it! Right where we chose to eat our lunch was a way cool old tree that has probably been growing since Shep was a pup and maybe longer than that. The sad part was that people had pounded in some big old nails and spikes into it. If anyone ever goes to cut it up, they will be in for a very rude awakening. But until then it’s a cool tree. So, after this lunch, we decided we had just enough time to work our way back past camp and maybe even have some time to explorer a bit more down the road from camp. 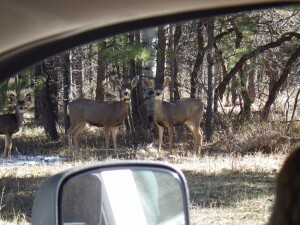 On our way back to the main road we saw several deer. There are actually two small two points in this picture sneaking away from us. One of these does has a collar on it. Going back we got another great view of the surrounding countryside. 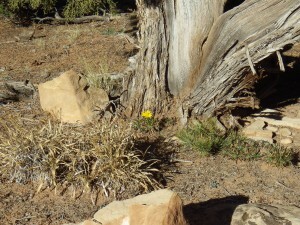 This was a higher view of the Canyon Lands area with Boundary Butte in the picture as well. The Salt Creek Mesa is the flat looking area just to the left and bottom of Boundary Butte and with a very close look you would be able to see the road. Take my word for it. 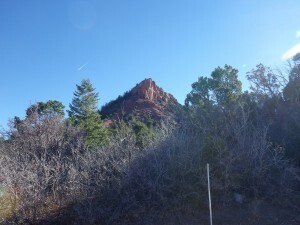 Once we were off this mountain and back on the Salt Creek Mesa flat, we took a couple of side roads to see where they went and what the views looked like. 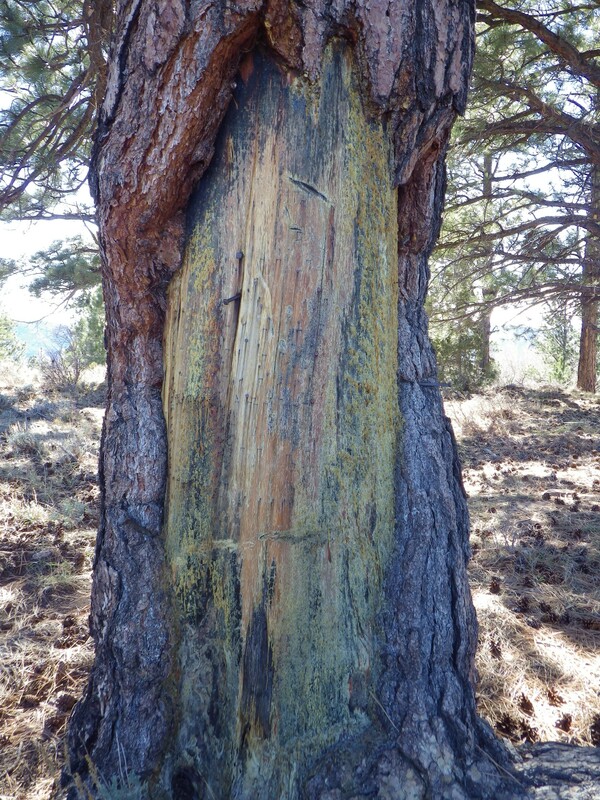 At the end of one, we saw a cool cedar tree that had been either hit by lightning a long time before or else the wind and snow had broken it, either way it looked pretty neat and at the base of it a little flower. 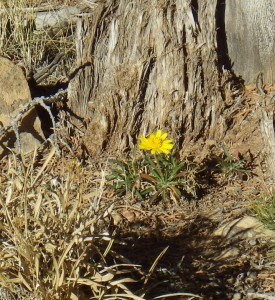 A beautiful natural setting for a beautiful little flower, one has to love what God does. Speaking of God, as we came down the road off the steeper portion of the mountain road, I saw where someone had almost gone off the edge. Of course this happened when the road was very slippery and muddy. The picture I took of the scene doesn’t show how crazy everything had to have been, but I’ll bet the driver of that vehicle had to wipe his behind when it was over. 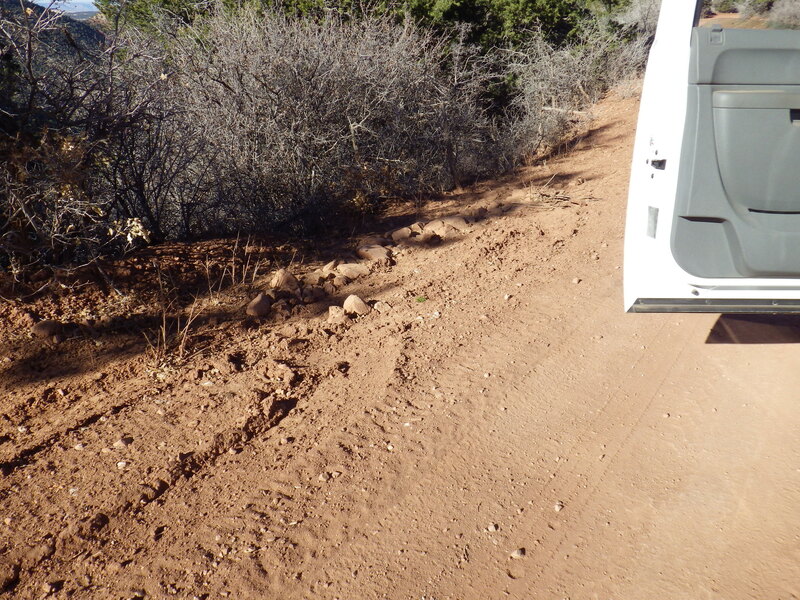 You could see where their left front tire actually went off the road and where they placed a line of rocks along between the edge of the road and their other tires to help hold the vehicle from going any farther in that direction. I’m glad they didn’t go over, because it was at least 100 feet to the bottom with very little brush to keep them from going all the way down. Before dark, Tracker and I carefully and quietly worked our way out to the edge of the clear cut where we had heard the elk run off this morning. We took up a position where we could see pretty good in at least three directions and we waited until dark, hoping the elk would come out into the open and offer me a shot. All we had that was exciting was a coyote howling about 20 yards behind us in the cedars. That was pretty exciting. Oh ya, and I found a bull whip some cowboy had lost years before. 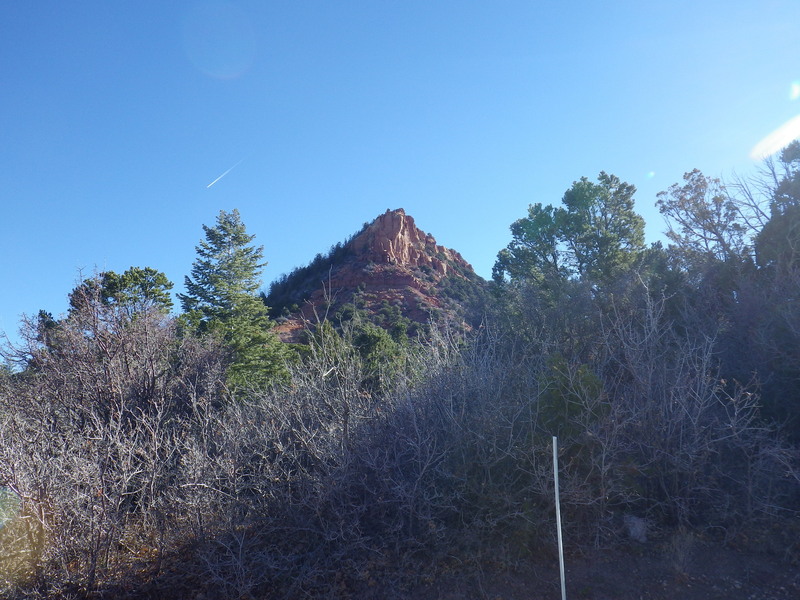 While we were sneaking our way to our waiting position, Weasel drove the truck down to a little side road and took a hike up on the side of Cathedral Butte in order to glass up the clear cut in our direction. We were in hopes that from his vantage point he would be able to see the elk and could radio to us where they were. No elk were spotted. And as Weasel continued to climb up the side of the butte, he got himself into such a precarious spot he had to continue to go all the way around the backside of the butte. After dark, Tracker and I made our way down to the truck and drove around the other side to wait for him to come around, flashlight in hand! 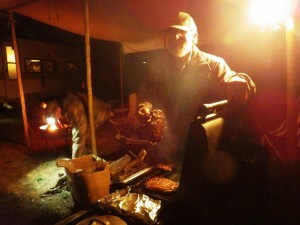 Back at camp, Tracker felt it was his turn to cook up the steaks and they certainly were good eatin! I must say, we eat well on our hunts, but if you are into vegetables, you are in the wrong camp. Steak, hash browns and garlic bread! It doesn’t get any better than that! After supper we enjoyed another evening of the Apparatus and an Ora Boriallis fire. Drank a few drinks and headed off to sleepy land in preparation for another day of hunting.